I just came across an exciting product and opportunity a couple weeks ago, that I decided to go ahead and try. 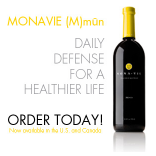 The product is Mona-Vie which is a wellness juice drink supplement made primarily from the acai berry. It also includes 18 other fruits from around the world. It is extremely rich in anti-oxidants and is the premier product available out there in the marketplace. I will be sharing the product and the opportunity it offers for both personal and financial health. I was introduced to Mona-Vie by the former innkeeper of The Williams House B&B, Sue and Doug Williams, that was located up on Queen Anne Hill here in Seattle. The team being put together to share this wonderful product and opportunity are all very excited about the prospects of one of the fastest growing companies out there. If you have any questions while staying at the Bacon Mansion, please feel free to ask. I will have it available on display, but do not plan on sharing the product with guests unless asked and if you show an interest. If you are a Mona-Vie user and don't want to bring it with you, let me know and we can provide your product of choice and I will make sure I have the inventory on hand for your stay for $5 a day for your two 2 ounce shots. Bottoms up to ours and your health.